Altenmarkt-Zauchensee, Austria – Oregon’s Jackie Wiles skied to her first career Audi FIS Ski World Cup podium on Sunday, finishing third in the much anticipated downhill in Altenmarkt. After three days of weather delays, the women ran an early morning downhill training run Sunday, and then headed back to the start for the real deal. The track at Altenmarkt proved faster for the later starters as Austria’s Christine Scheyer took her first career World Cup win coming from the 25th start position. Tina Weirather of Liechtenstein was second from the 17th start position. Wiles, whose previous career-best World Cup downhill result was 15th at Cortina d’Ampezzo in 2014, came from the 26th start position. Scheyer had only ever stood on a European Cup podium twice and competed in a total of three World Cup downhill races prior to the day. But she had scored in all three, with a best result of ninth in Val d’Isere, and she knew she had the potential to be somewhat fast, at least within the top 10. Weirather was holding down the leader box when Scheyer overtook her, but she was still thrilled to finish the day in second place. For Wiles, Sunday’s podium came at just the right time ahead of three weeks of speed events leading into the World Championships next month in Switzerland. “To come down in third is a dream come true,” said Wiles, who took some time off over the holidays to recharge. “I’ve had a tough start to the season and seen so many expectations falling flat, so I really needed this and it couldn’t have come at a better time. “This is definitely going to help my confidence moving forward. Hopefully I’ll have some good skiing coming,” she added. Two top-10 ranked athletes heading into the day suffered season-ending injuries during the training run and were long-lined via helicopter off the slope. Nadia Fanchini of Italy sustained a fracture to her right humerus and also transverse process fractures in the lumbar vertebrae. She will undergo surgery in Italy and will miss the rest of the season. Edit Miklos of Hungary also crashed during the training run and sustained a severe right knee injury including unspecified ligament ruptures and a patella injury. She also sustained a less serious injury to her left knee. 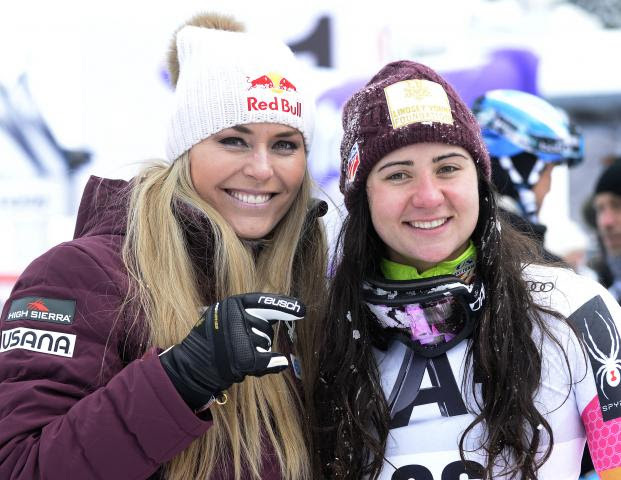 Nevertheless, Vonn was stoked not only to be to back racing for the first time on Sunday, but for her teammate Wiles, who is sponsored by the Lindsey Vonn Foundation. In Sunday’s race, four Americans stacked into the top 16 with Wiles leading the way. Laurenne Ross, of Bend, Ore. was 12th, followed by Vonn in 13th and Breezy Johnson, of Victor, Idaho, in 16th. Switzerland’s Lara Gut finished fourth to cut into Mikaela Shiffrin’s overall World Cup lead. Shiffrin, who did not race Sunday, holds the lead with 1,008 points. Gut is second with 693, and Slovenia’s Ilka Stuhec, who was fifth Sunday, is third overall with 584 points. Stuhec continues to lead the overall World Cup downhill standings with 345 points. Up next, the women head to Garmisch-Partenkirchen, Germany for downhill Saturday and super G on Sunday.